During the 1860s in the South Pacific, Capt. Ralls, skipper of the Red Witch, has a series of adventures involving sunken gold bullion, pearls, natives, an unscrupulous ship owner and a giant octopus. Quirt Evans: Funny thing about pancakes: I lose my appetite for 'em after the first couple a dozen. Mrs. Worth: Aw, they weren't very good this morning... too heavy. As this film was not directed by John Ford or Howard Hawks, it is not remembered as one of Wayne's best, but it certainly is. A romantic story about a gunfighter(Wayne ) who falls in love with a Quaker woman (Gail Russel), is almost surrendering himself to domesticity, then has a last go at his old lifestyle. What makes this film so good is the peculiar beauty, charm, and excellent performance of Gail Russel which has an incredible chemistry with Wayne at his best. She falls instantly in love with him when he shows up wounded at her ranch and you can feel it without her saying one word, just by her expression. 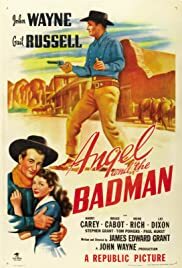 Harry Carey who used to play cowboys in silent movies is the Marshal, a key character, and also Bruce Cabot(King Kong), who made many B westerns is the bad guy, Laredo.